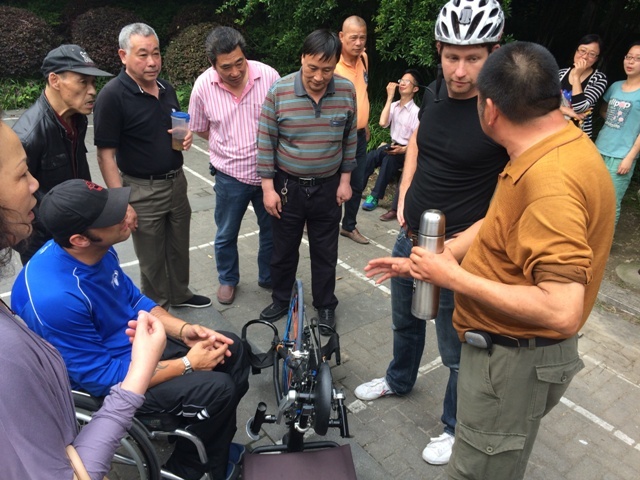 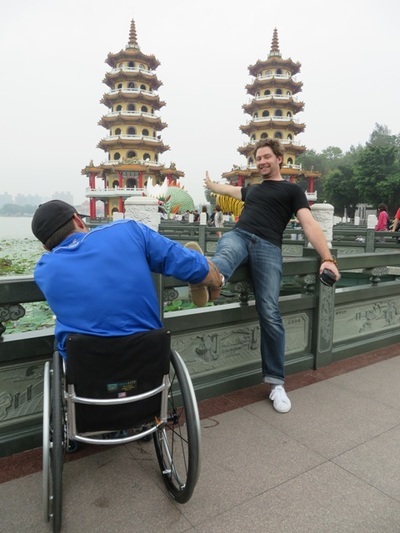 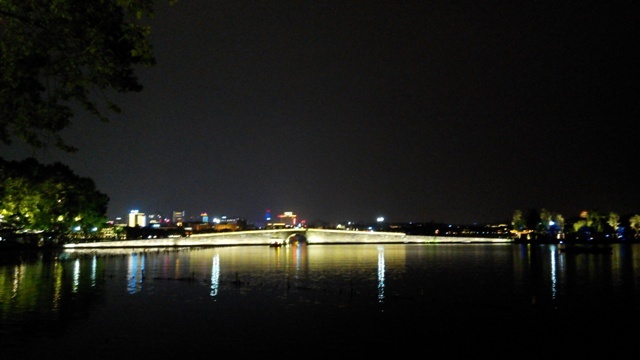 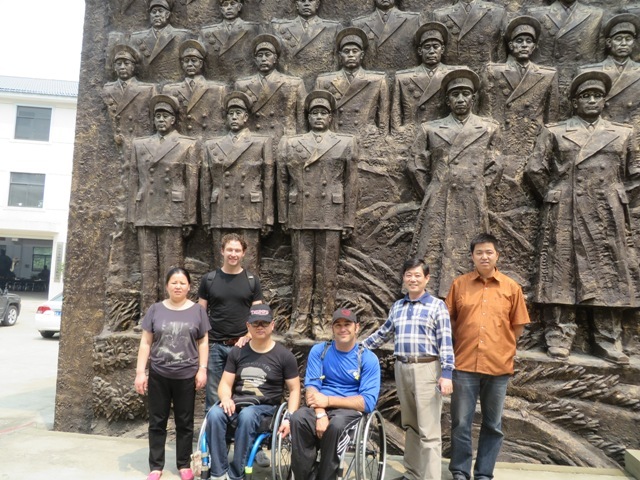 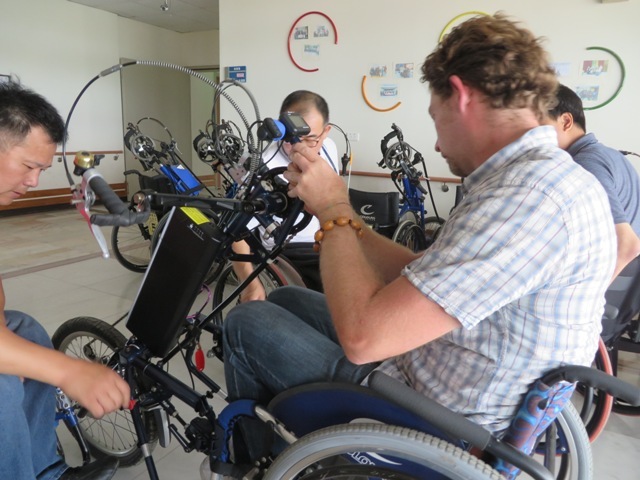 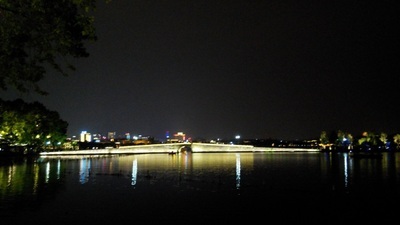 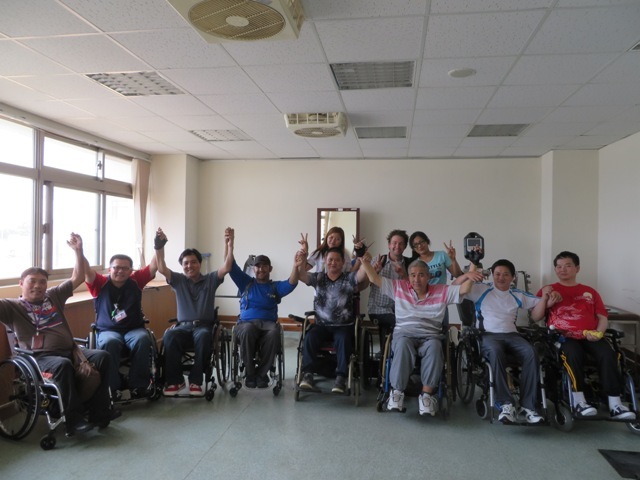 During our trip to Hangzhou in 2013, we had a very productive meeting with an NGO and the Shangcheng District government, during which we decided to hold a handcycling clinic in May of 2014, providing the impetus and momentum we needed to do another trip. 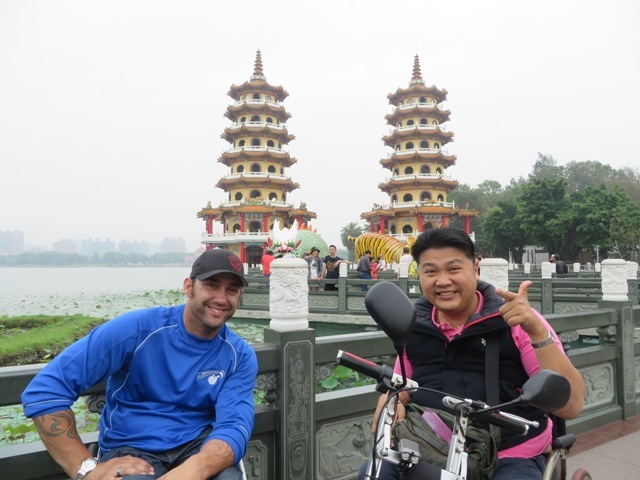 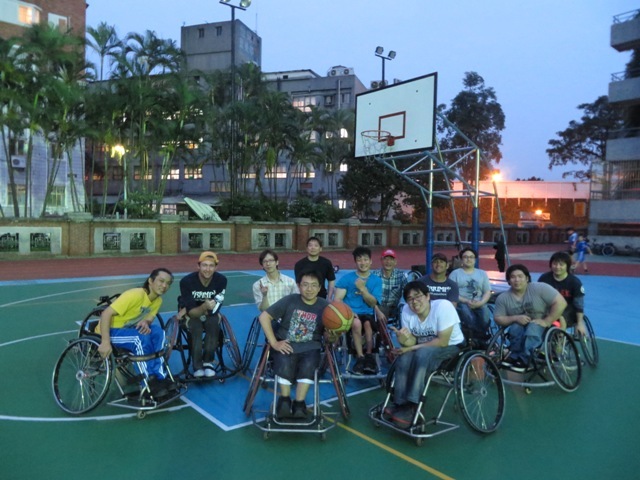 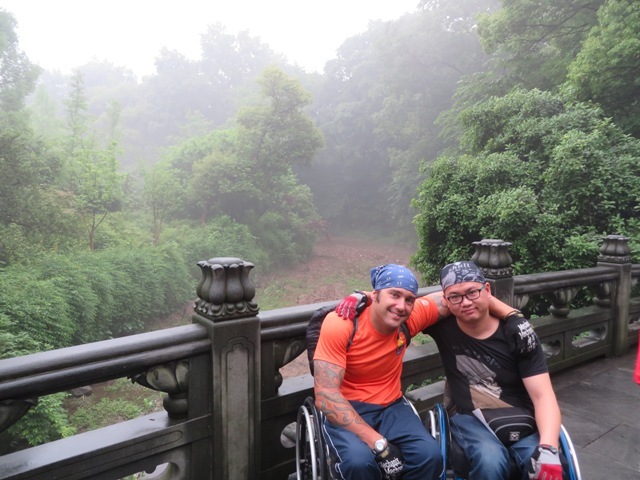 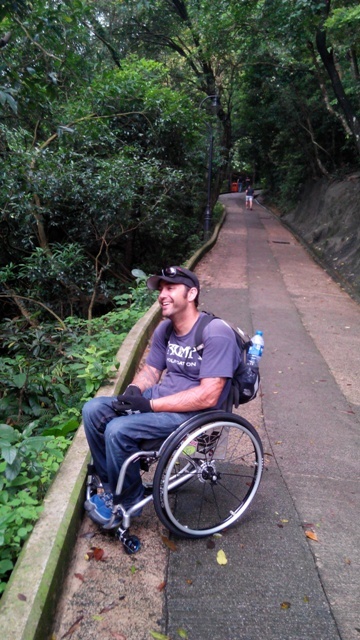 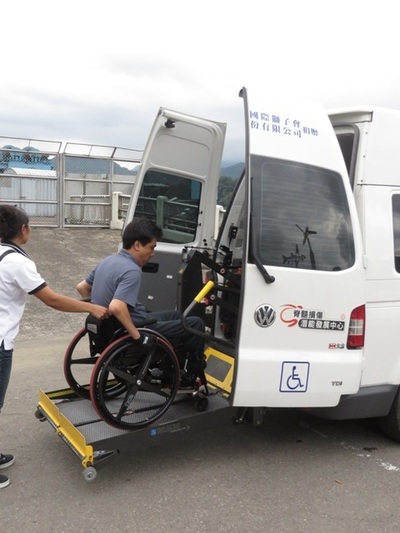 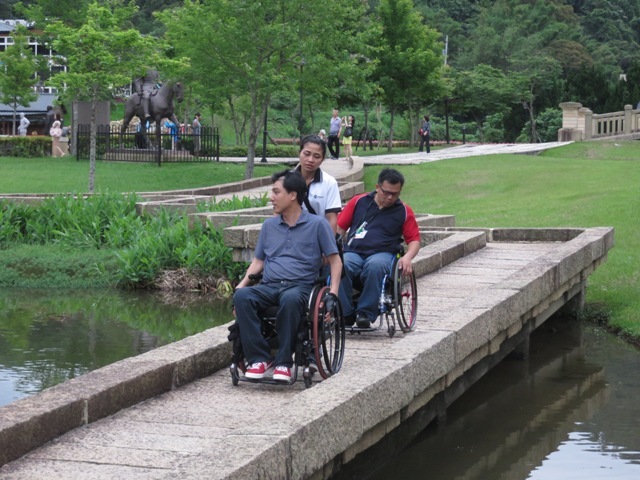 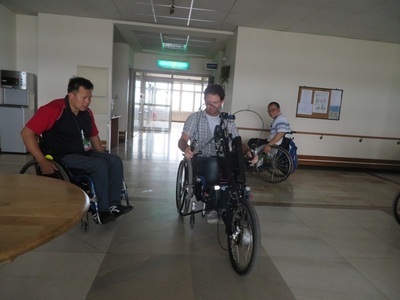 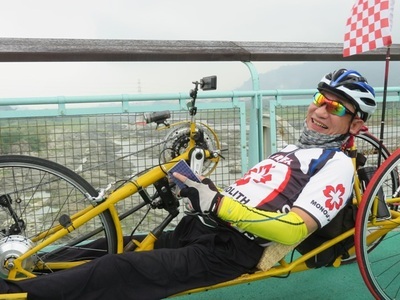 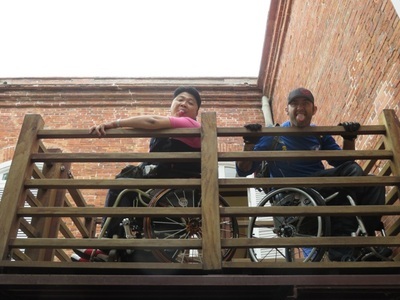 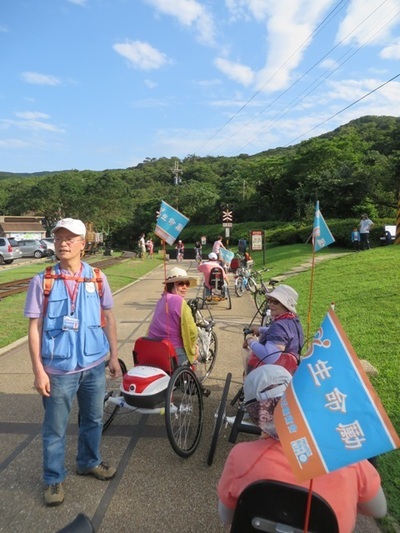 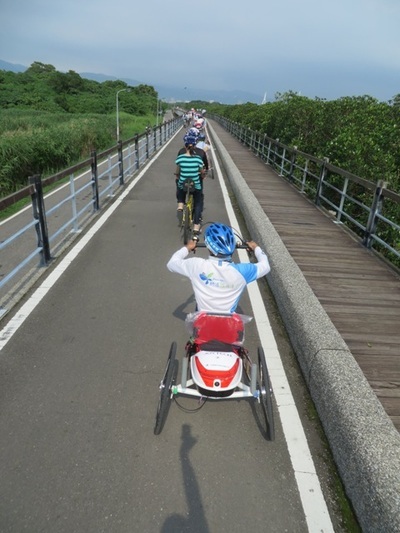 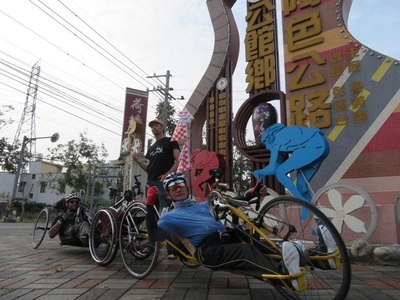 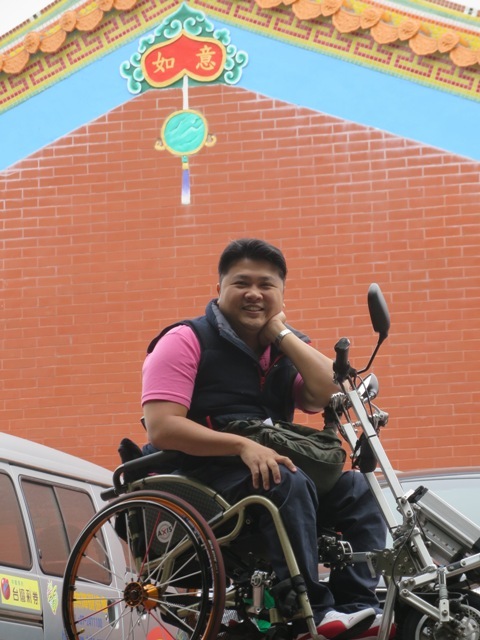 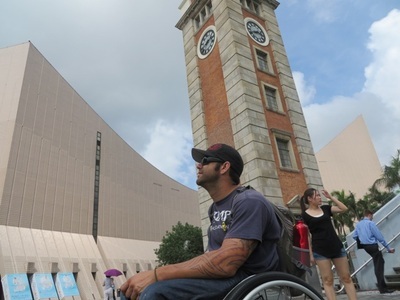 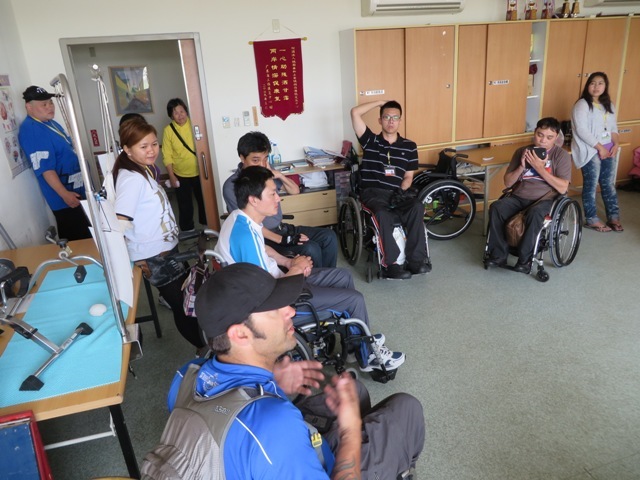 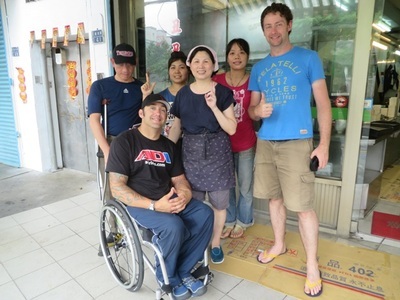 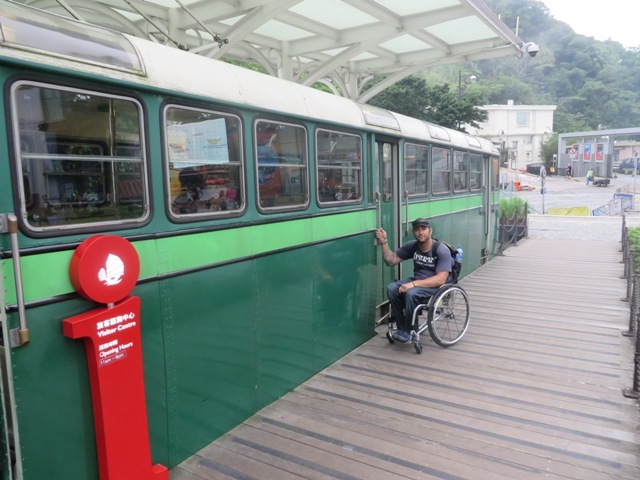 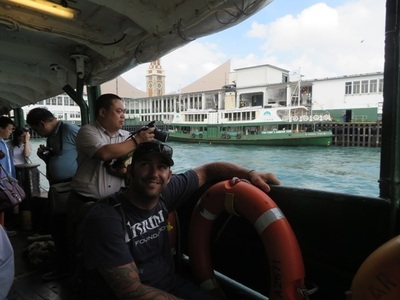 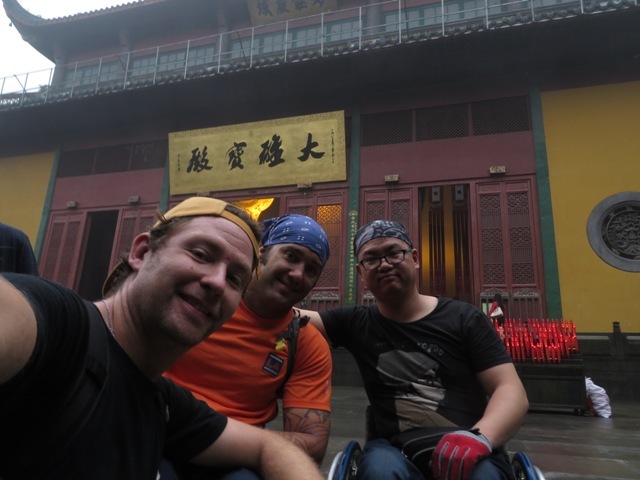 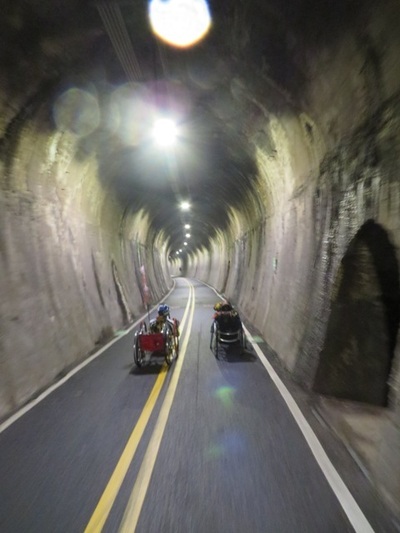 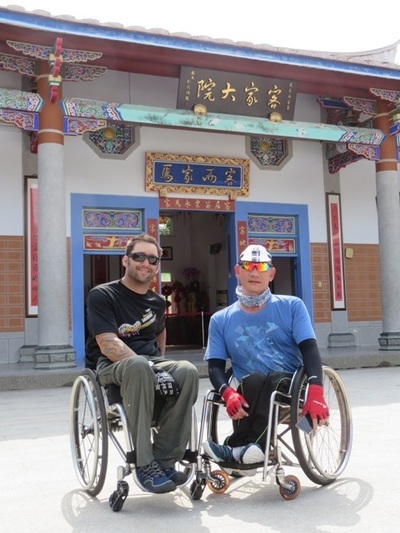 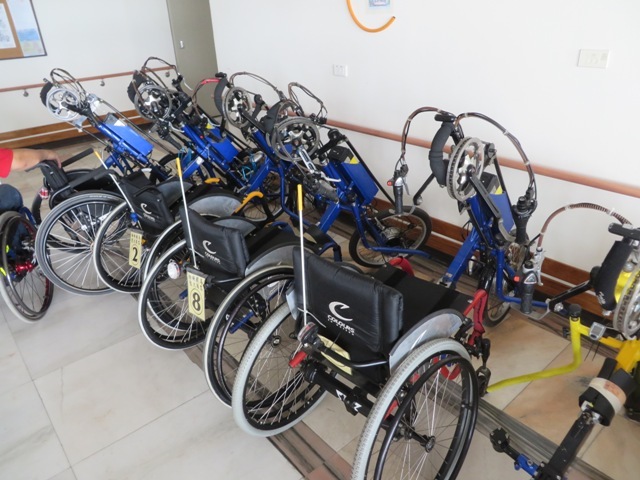 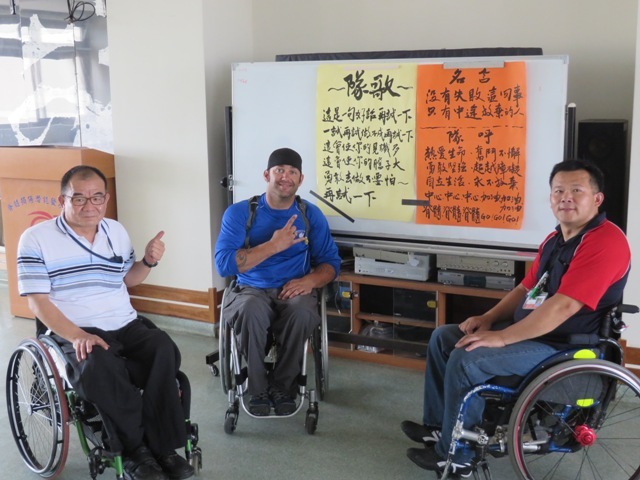 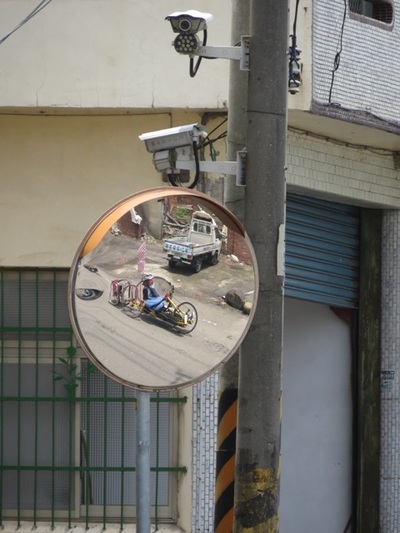 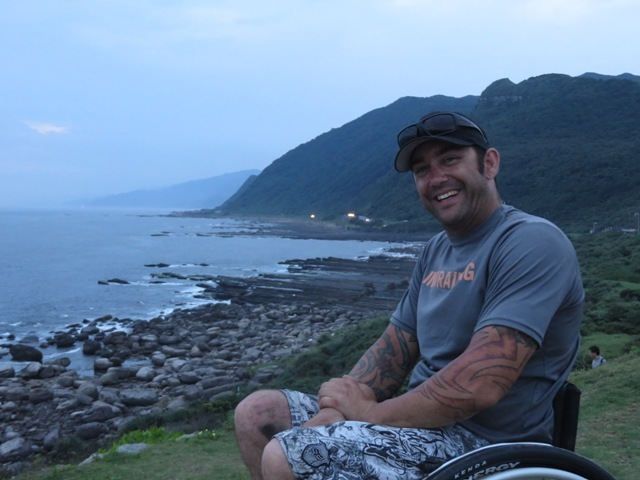 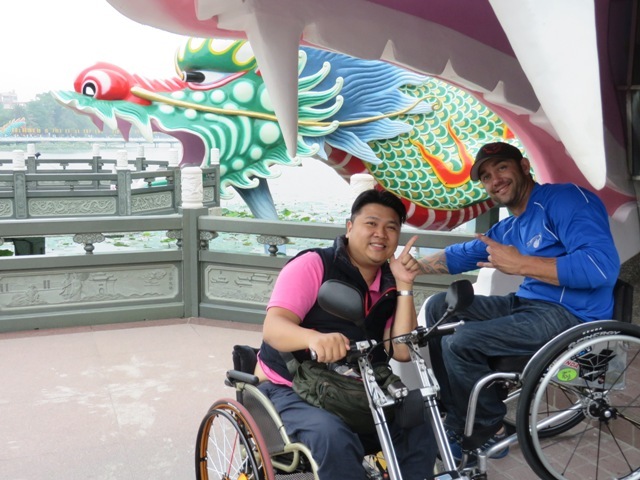 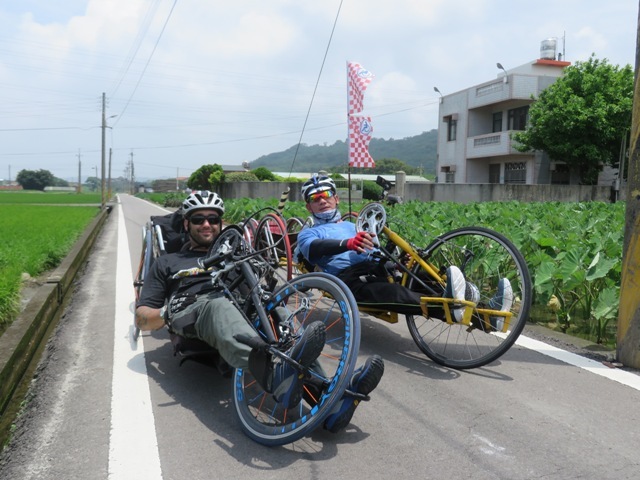 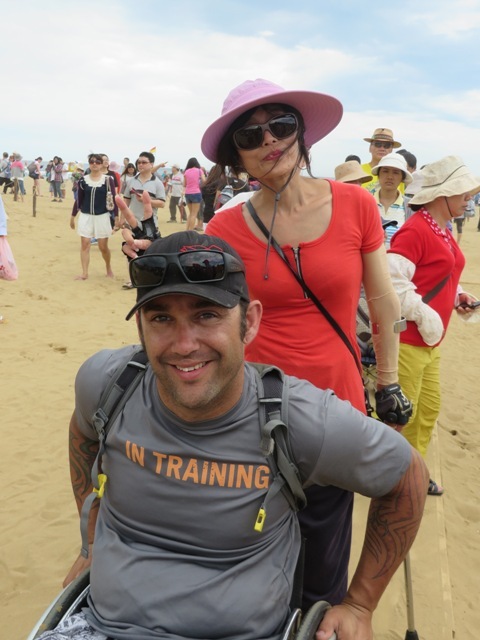 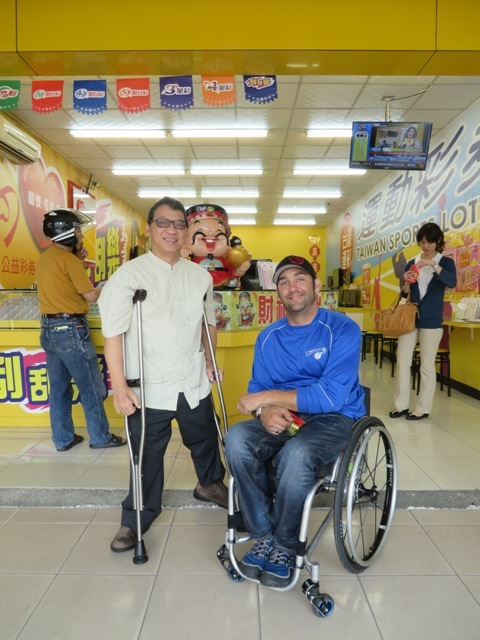 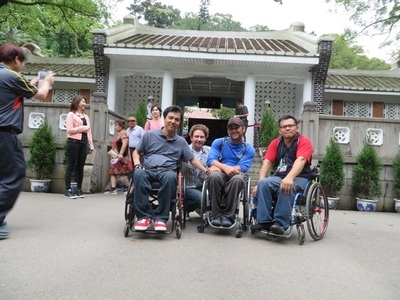 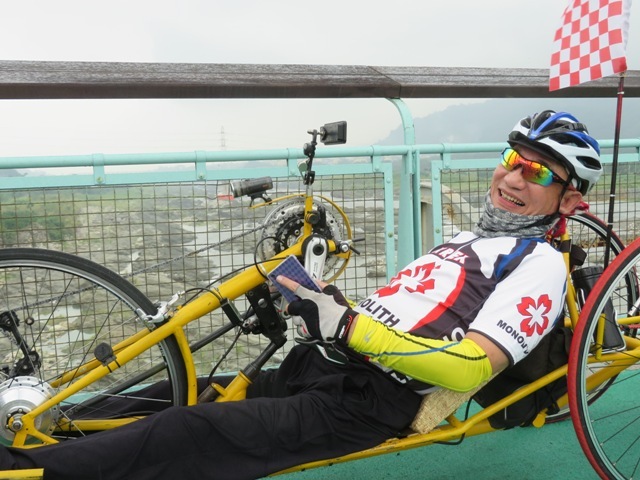 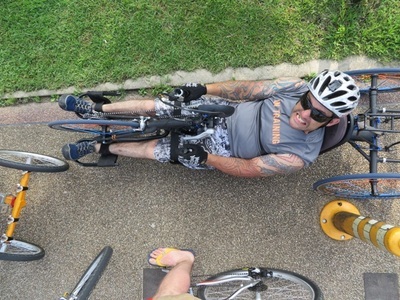 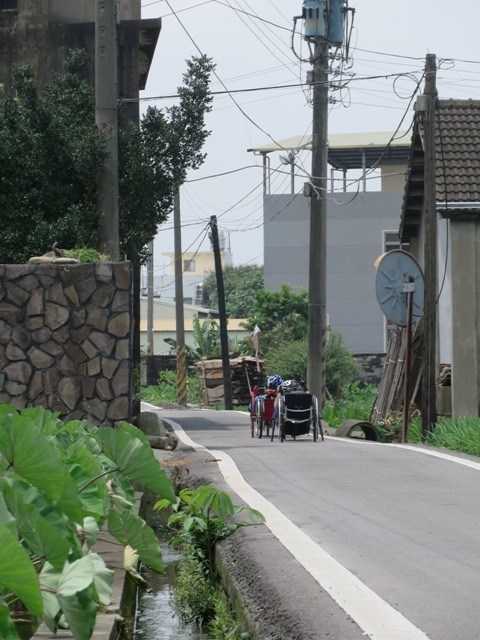 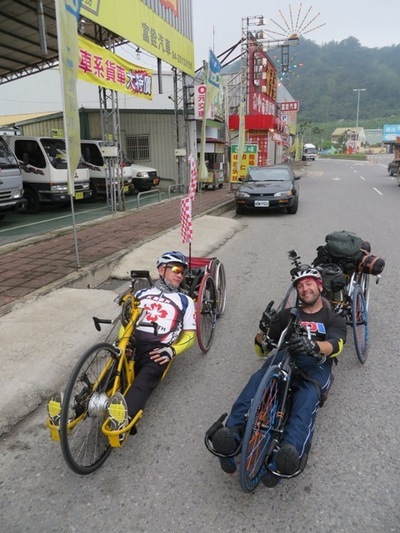 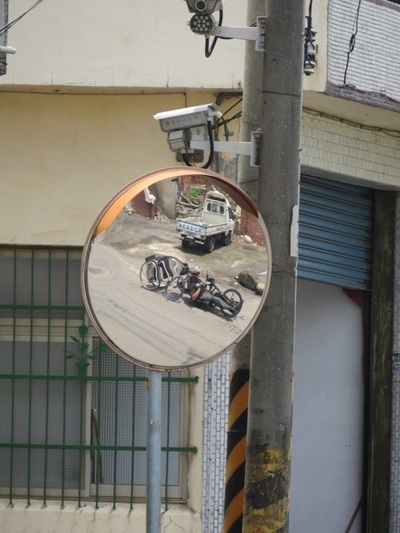 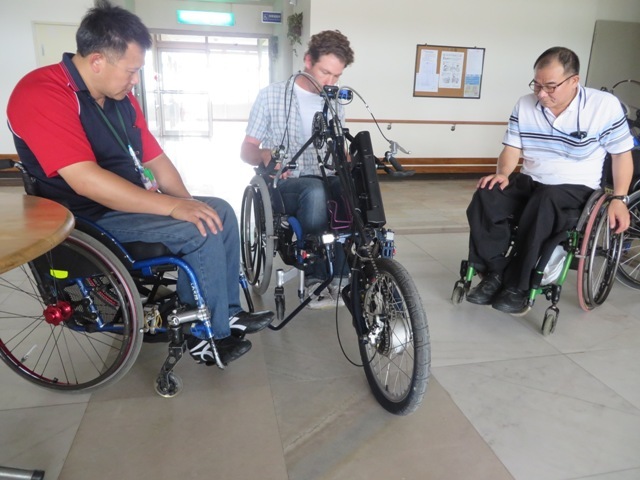 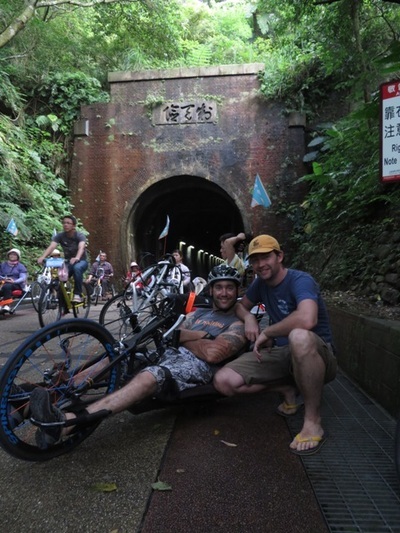 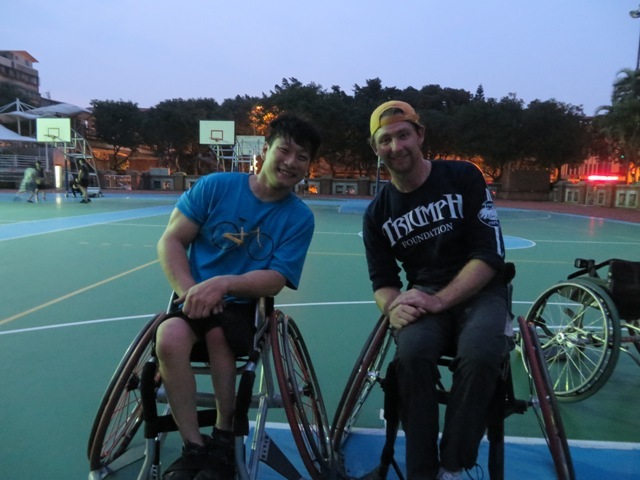 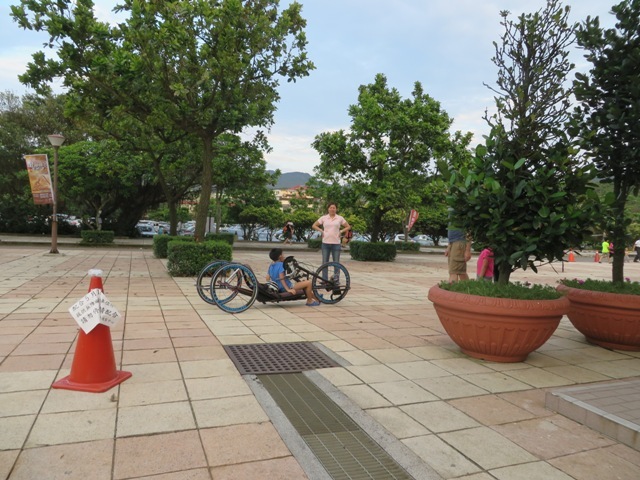 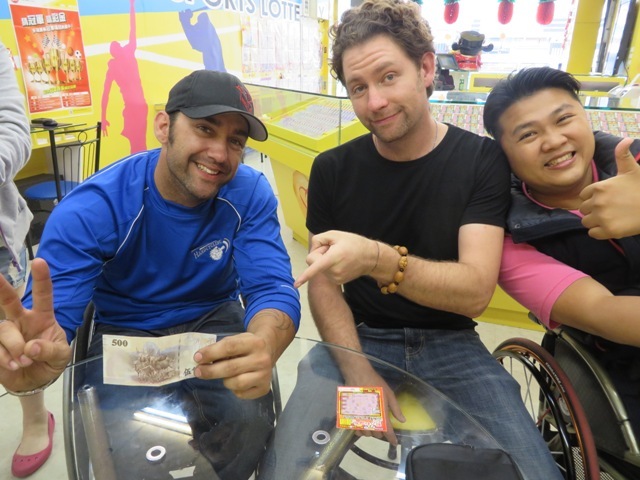 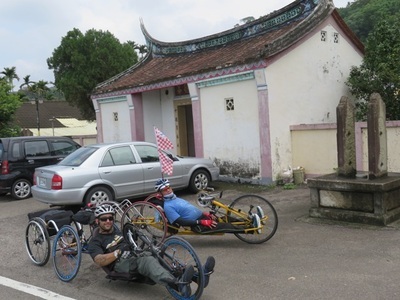 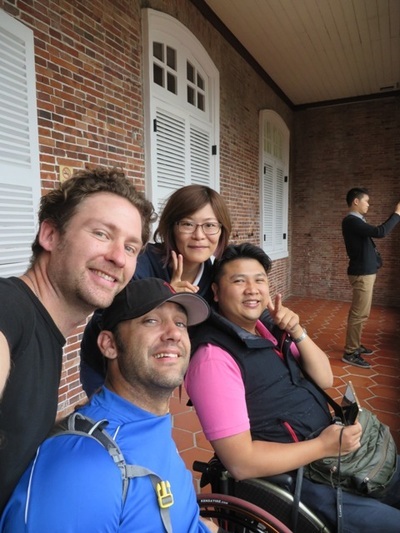 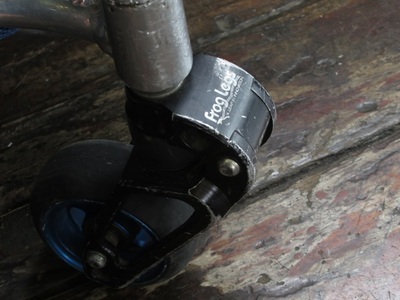 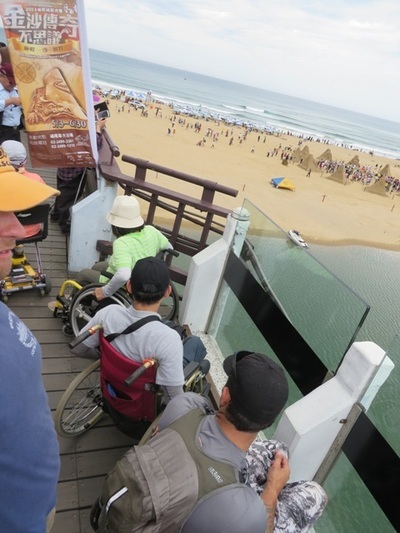 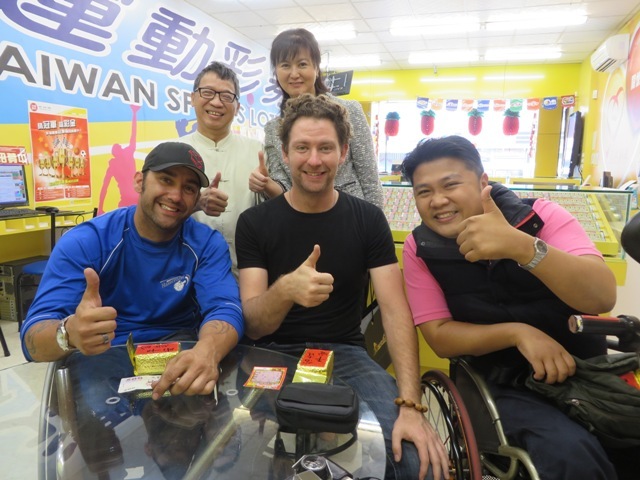 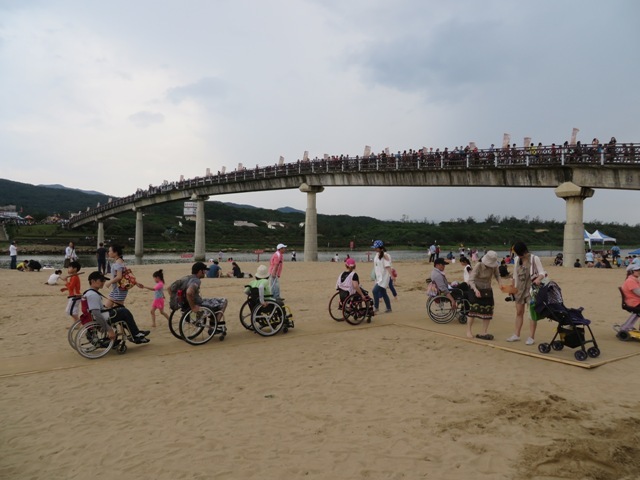 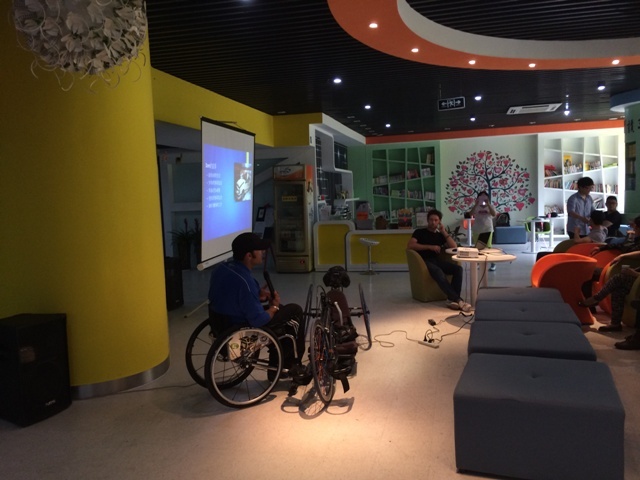 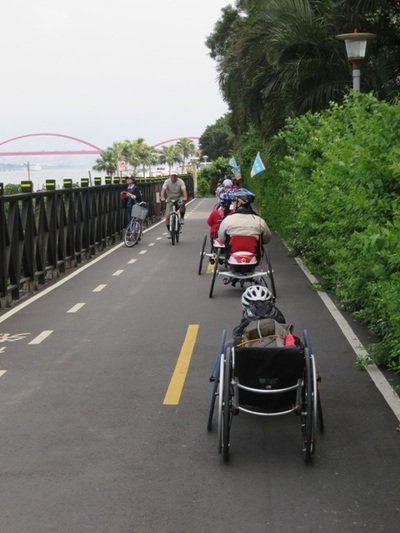 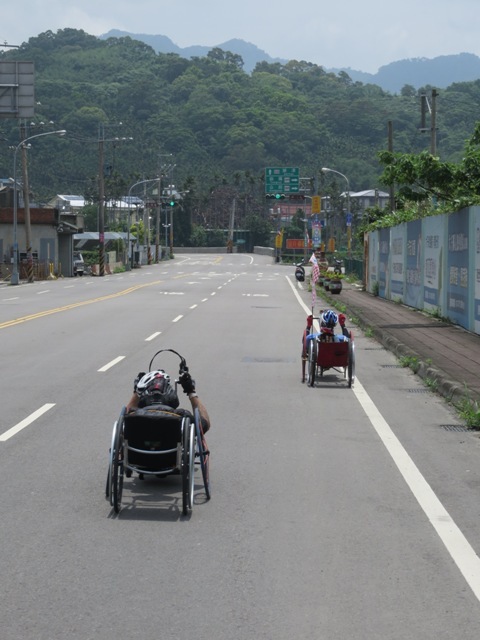 As planning went forward, Joshua visited Taiwan in early 2014 for a project and after a few initial inquiries into handcycling in the area, the results were impressive and we learned that Taipei has a very active handcycling community. 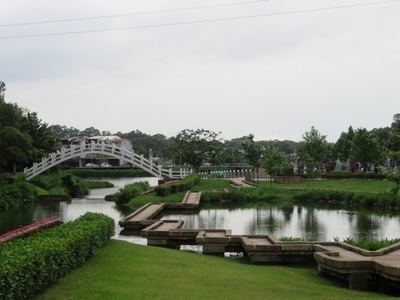 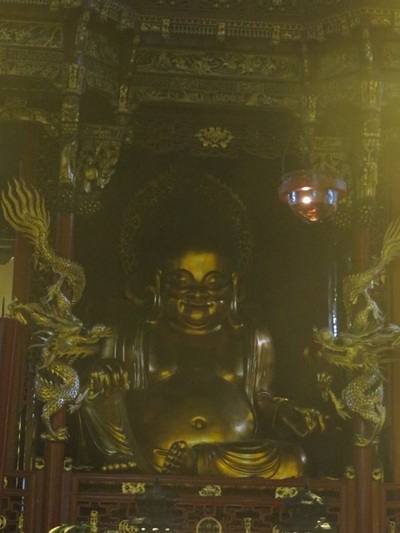 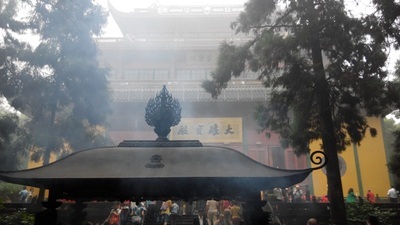 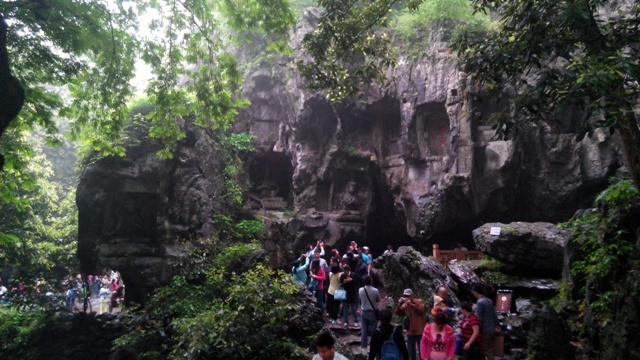 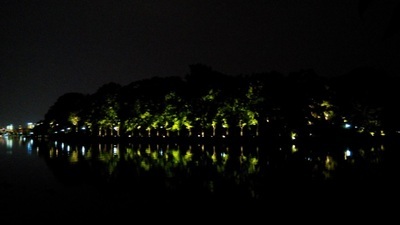 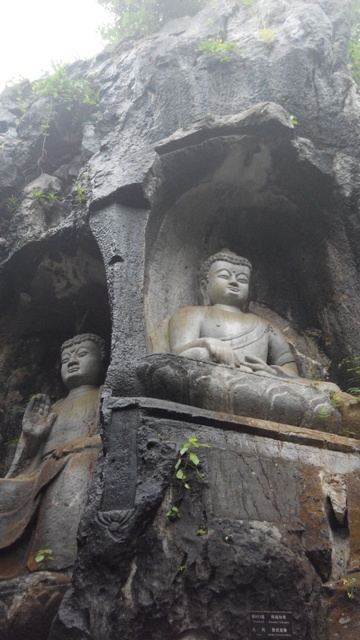 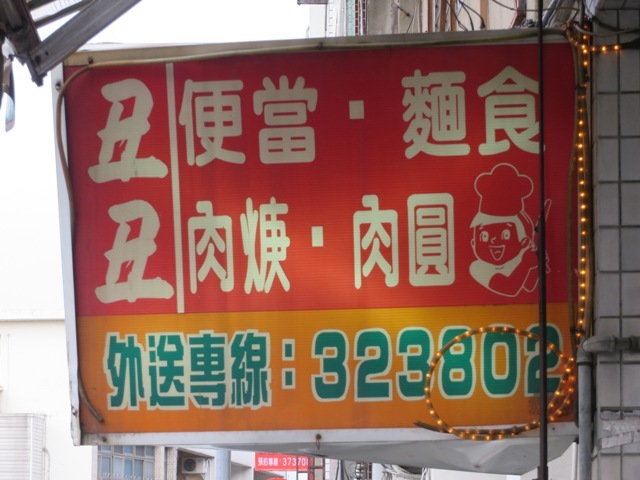 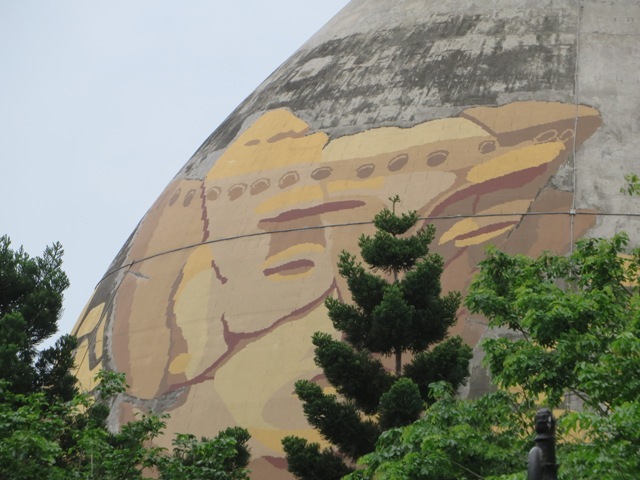 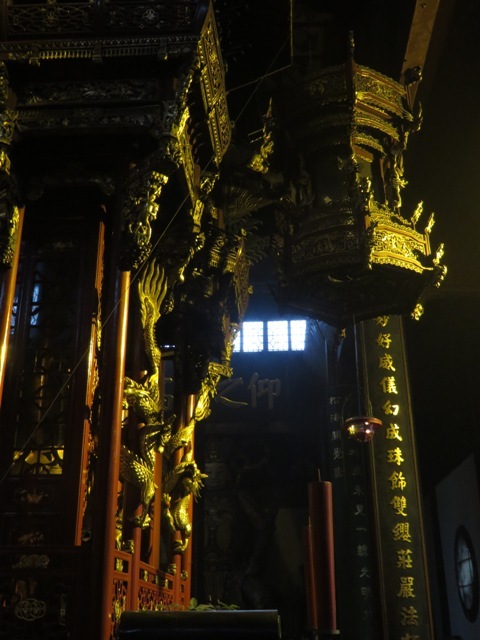 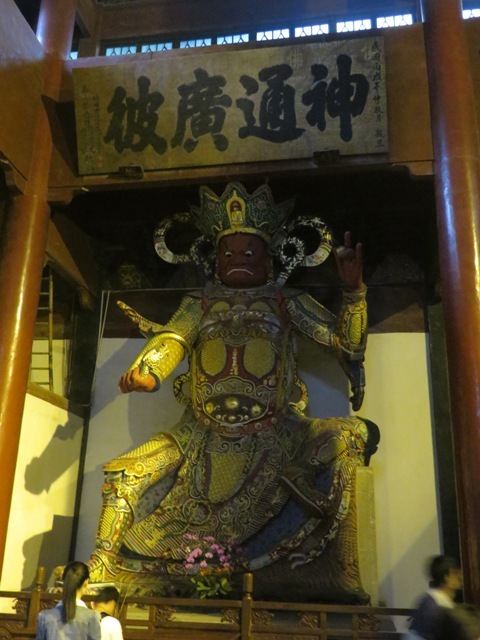 We both felt that Taiwan was worth a look and decided to include Taiwan in our next adventure. This, our second journey, began in the city of Kaohsiung in southern Taiwan - reached via Taoyuan Airport and a high-speed rail link. Once there, we met up with Charles Yeh, a friend from last year's rehab expo, and Mr. Lin Junfu of the Taiwan Disability-Free Association, who introduced us to the efforts Taiwan is making in terms of employment and access for disabled individuals, including business ownership through the country's lottery system. 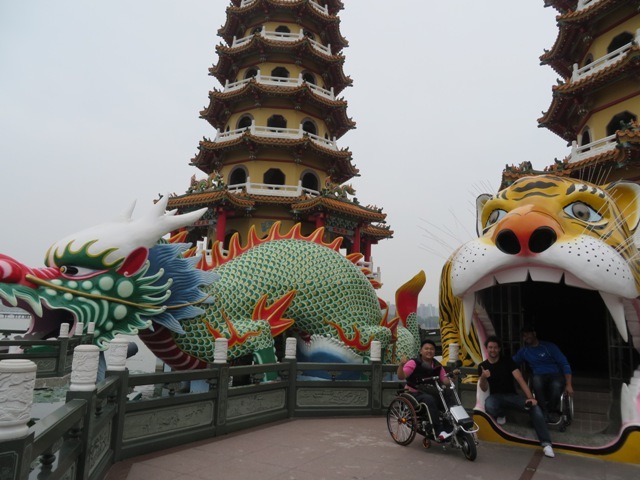 Our afternoon was full, visiting several sights in Kaoshiung with Charles before catching the last high-speed train to Taichung that night. Our next morning was early. 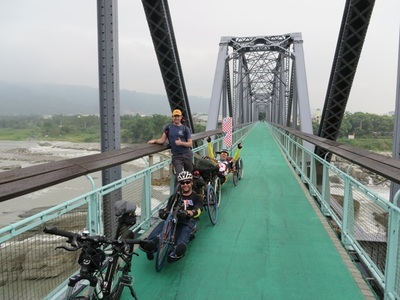 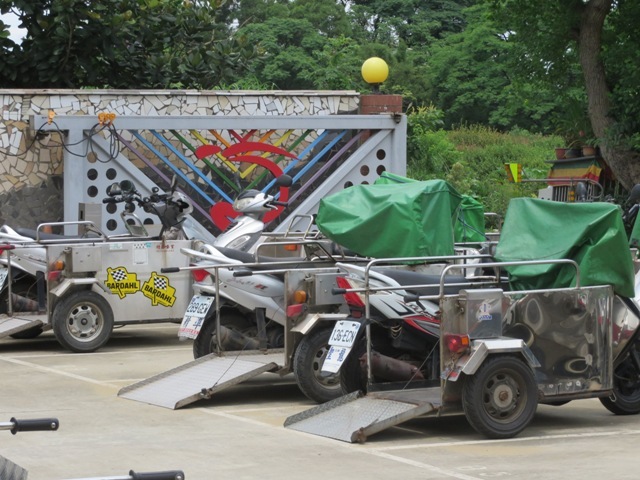 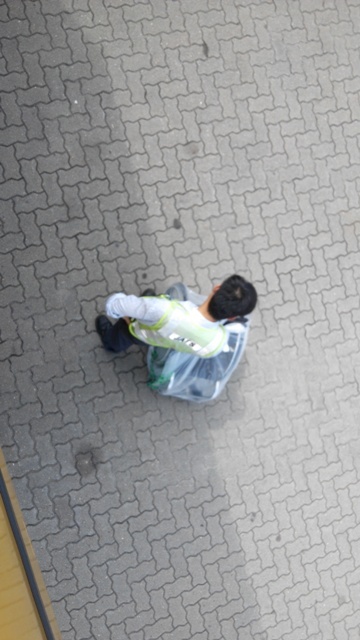 We picked up the bikes, which had been shipped via rail to Taichung Station, and hit the road running, strapped with all our gear, with 15km before we would meet up with another friend, Chiu, another handcyclist who had built his own bike with the help of a friend. The day started out nice, but quickly turned to rain, sometimes torrential, but we stuck with it and somehow after 80km of riding, soaking wet and tired, it still felt incredible! 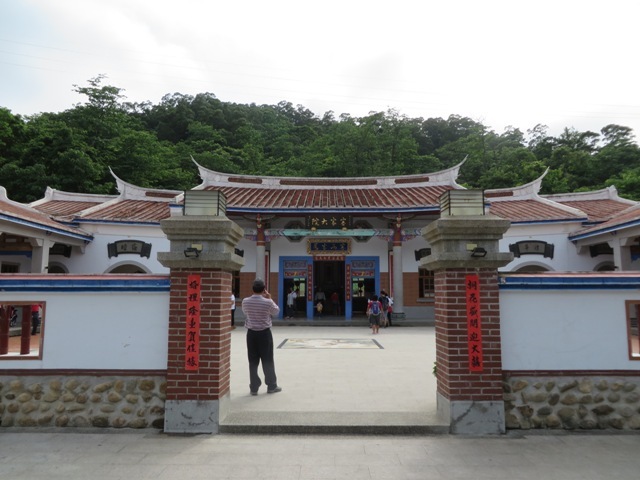 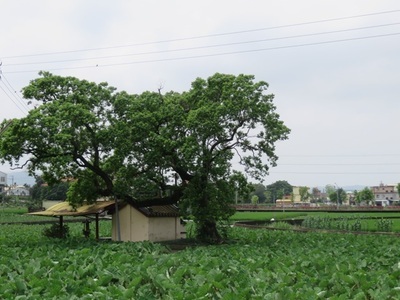 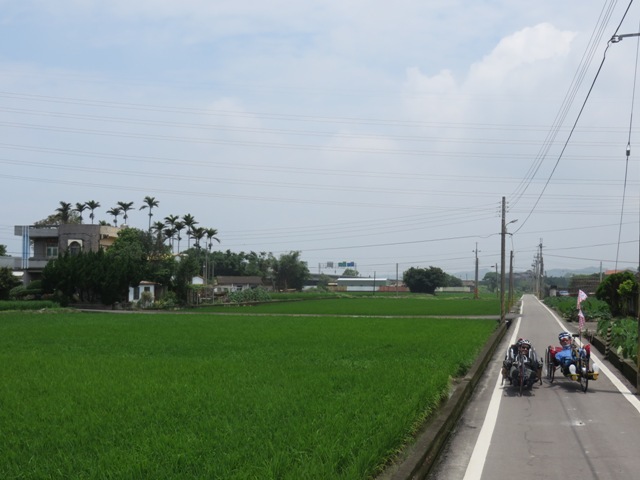 After a good night's sleep our next day was a more relaxed ride through the countryside around the town of Miaoli, passing by fields of rice and taro, small temples and traditional homes of the Hakka people. 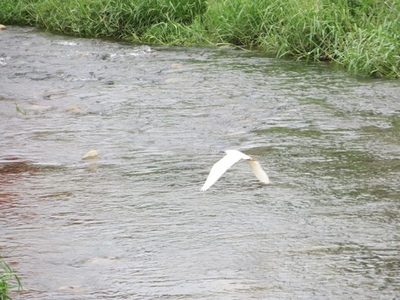 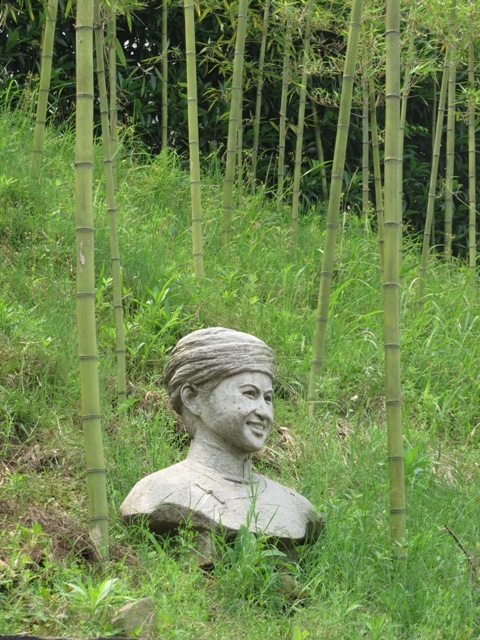 This is Taiwan - simple, green and truly beautiful! 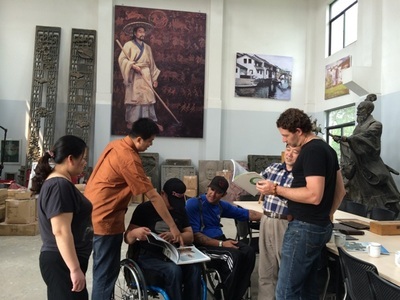 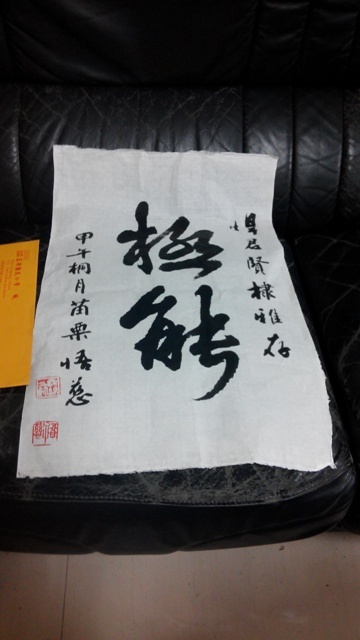 We gathered a crowd of curious onlookers at lunch who wished us well and in the evening met with Chiu's brother, a calligrapher and artist who was inspired by our journey and created two pieces of calligraphy to mark our visit. The next morning we had to move on, taking the train from Miaoli to Taipei, where we would meet up with Bike, Health, Life - a handcycling organization that is doing some awesome work in making hancycles available at locations around Taipei that people can use FOR FREE!! 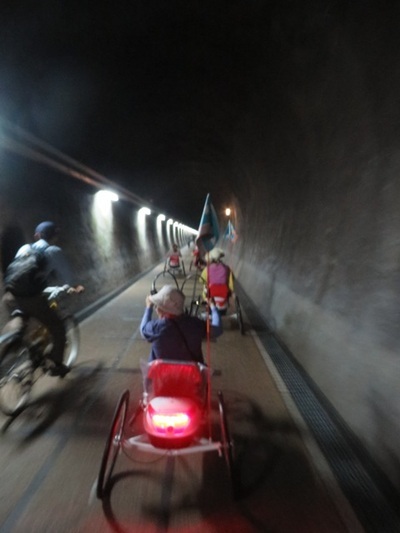 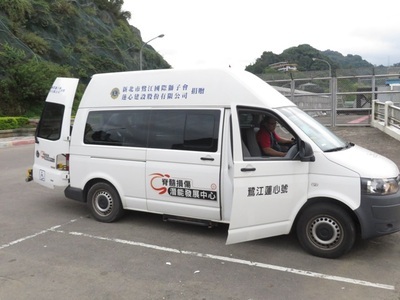 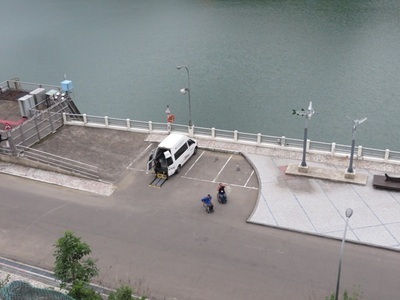 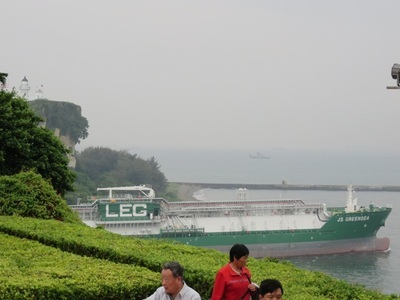 Li-rong, the group's organizer, had organized two days of activities for us - the first a ride along the Tamsui River all using first-rate bike paths. 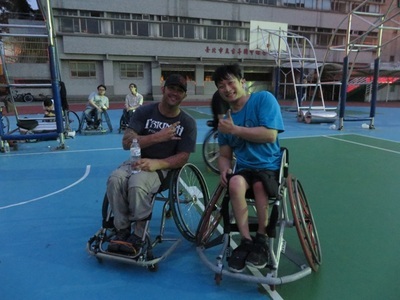 And if that wasn't enough for one day, we RODE another 20km through the city to meet up with an independently organized wheelchair basketball team for one of their weekly practices, playing ball for another couple of hours before getting back into the bikes and riding to the hotel where we crashed. 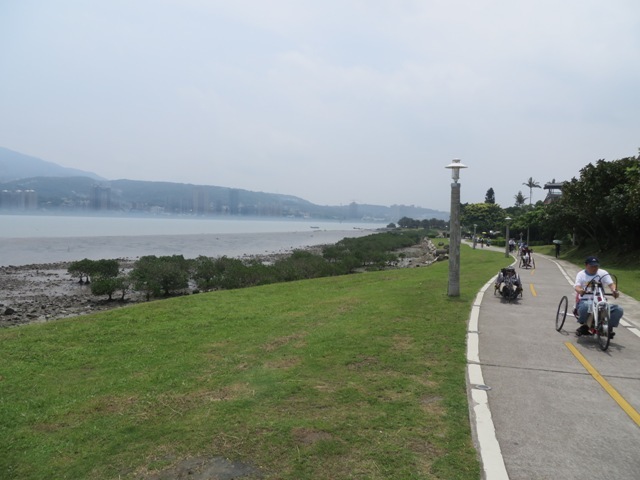 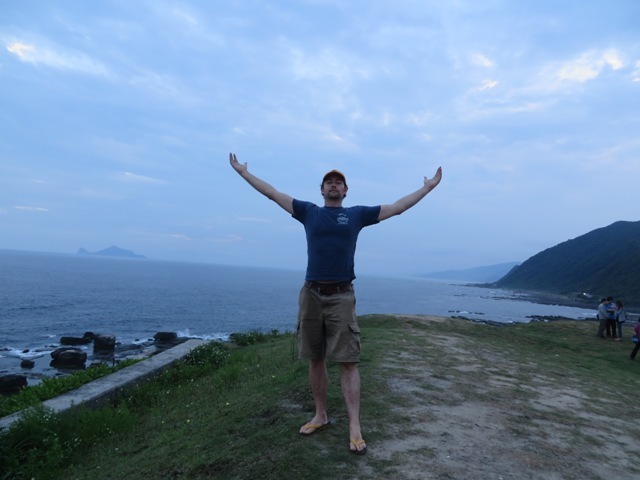 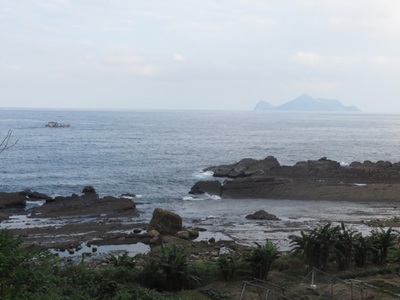 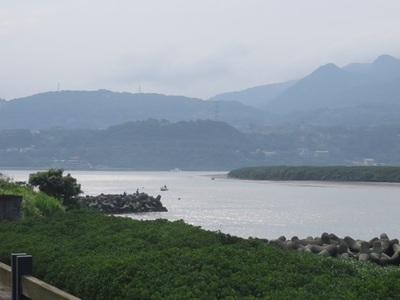 Our second adventure with Bike, Health, Life was a trip to Taiwan's northeastern coast for a day of kayaking, cycling and touring along some beautiful coastline. 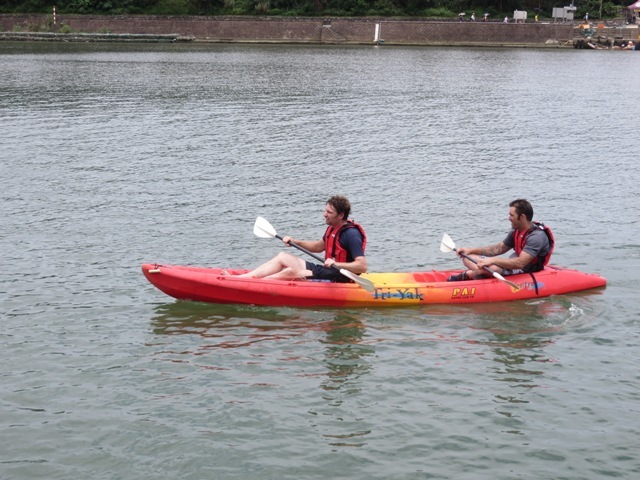 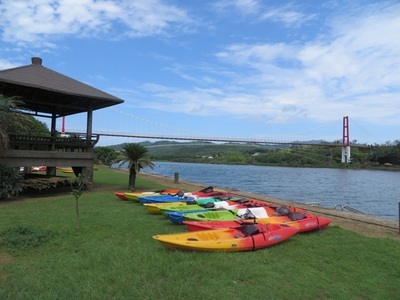 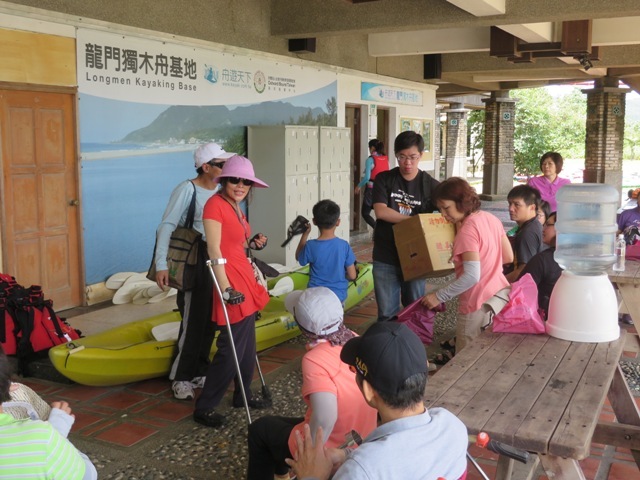 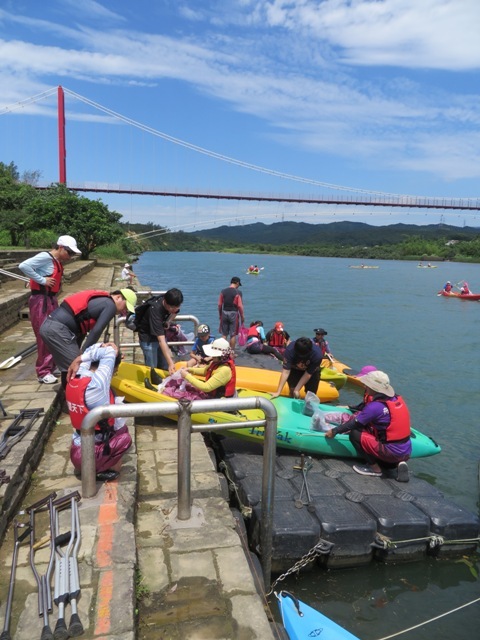 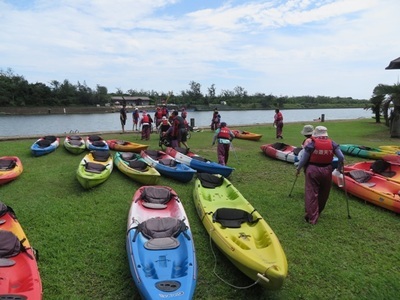 The kayaking event was attended by about 30 people with a range of disabilities and was in cooperation with a local kayaking club who were all very professional. Excellently organized! 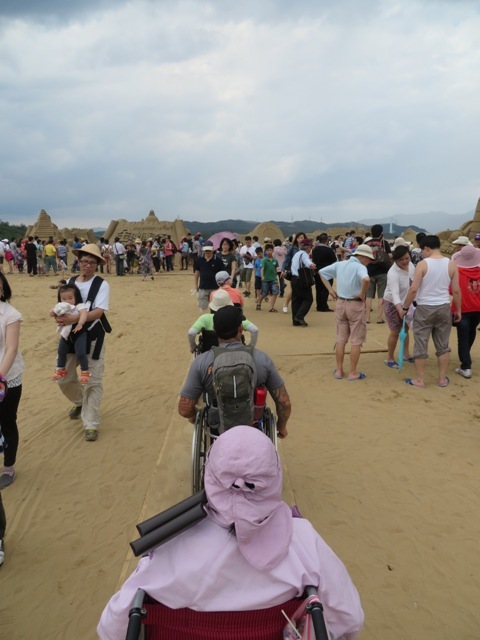 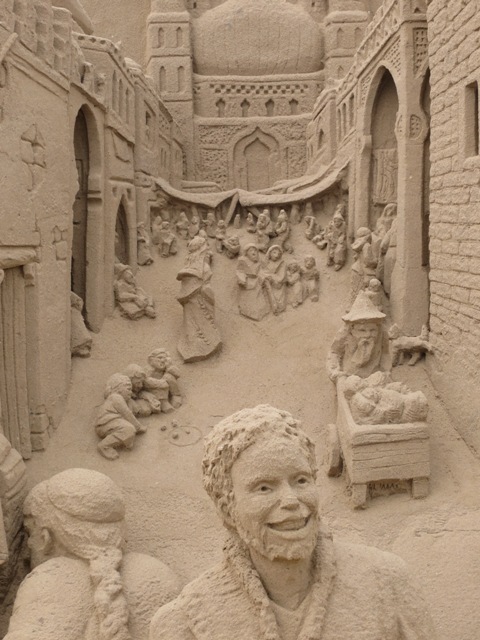 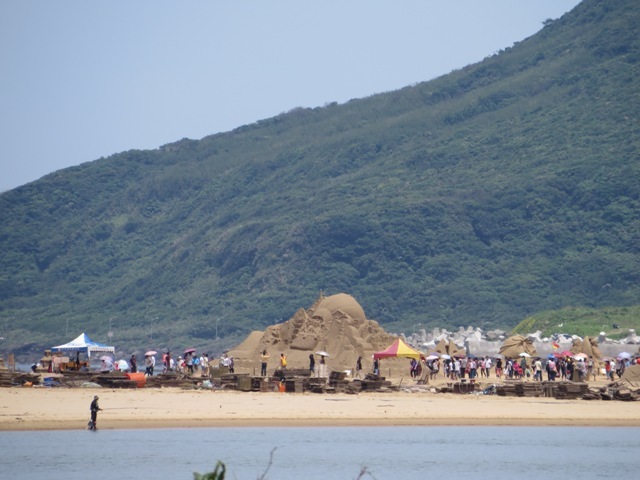 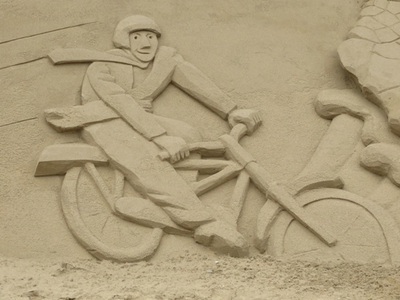 Next stop was a sand sculpture event, which once again had been coordinated with the organizers to enable easy access to the display area. 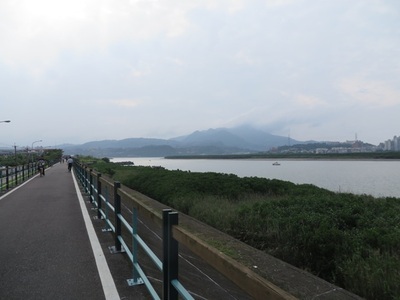 Finally, a ride along another very nice bike path converted from an old rail line took us to some amazing views of Taiwan's rugged east coast. 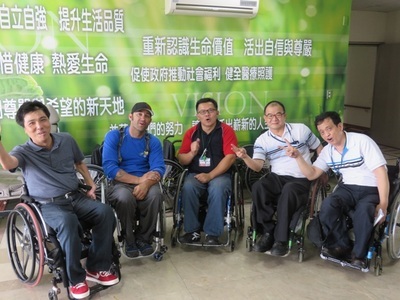 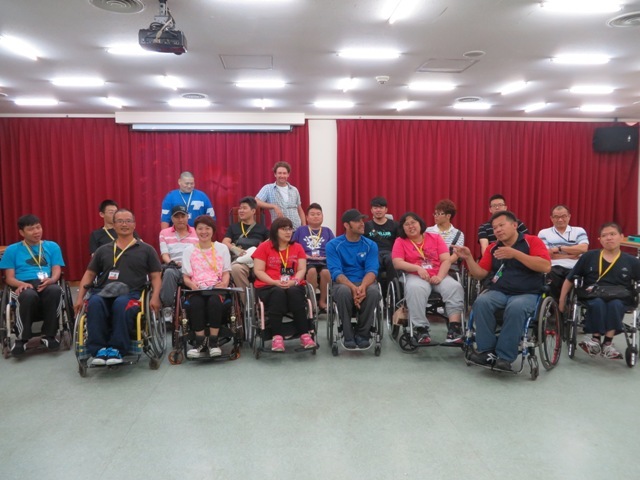 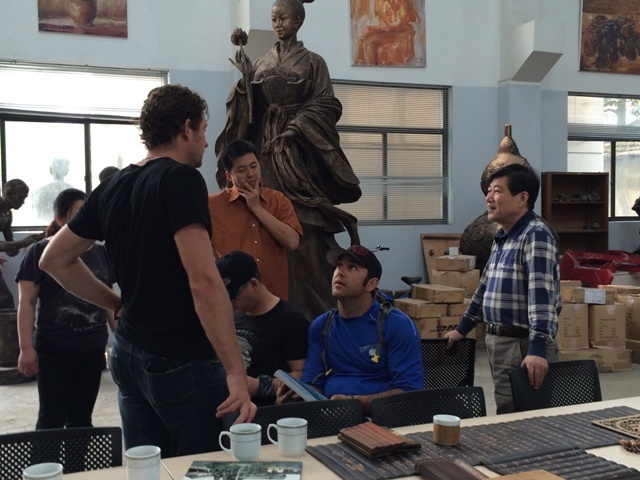 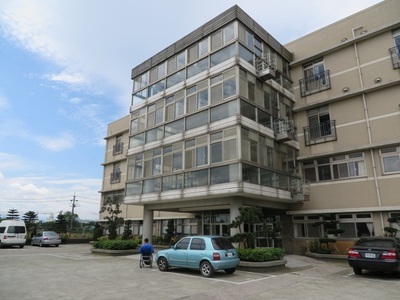 Our last event in Taiwan was a visit to the Spinal Cord Injury Rehab and Training Center in Taoyuan where we learned how the center helps people throughout Taiwan, and beyond, to live independent and professionally productive lives through their training programs and employment opportunities. 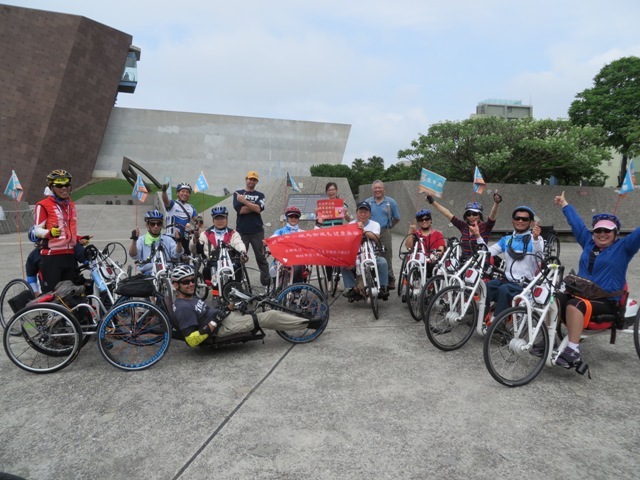 The Center has also organized cycling events and actually gone around the island - a popular rite of passage and one of our future goals!! 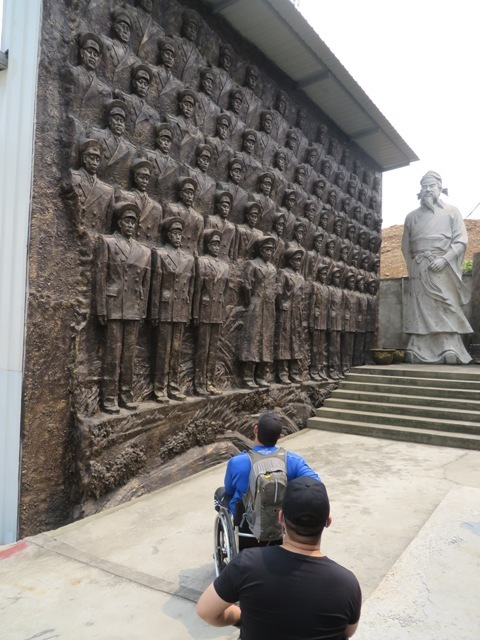 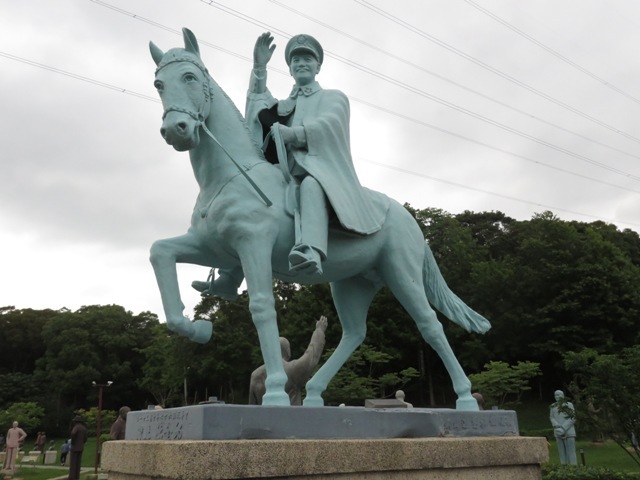 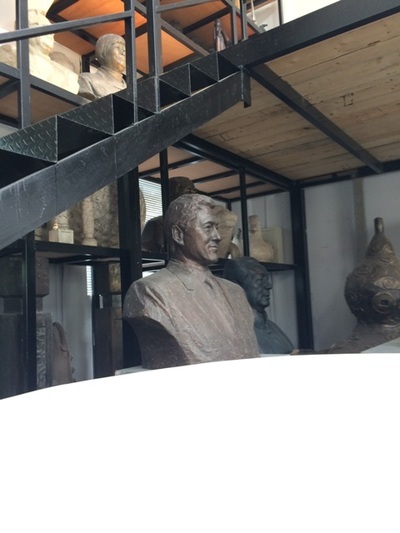 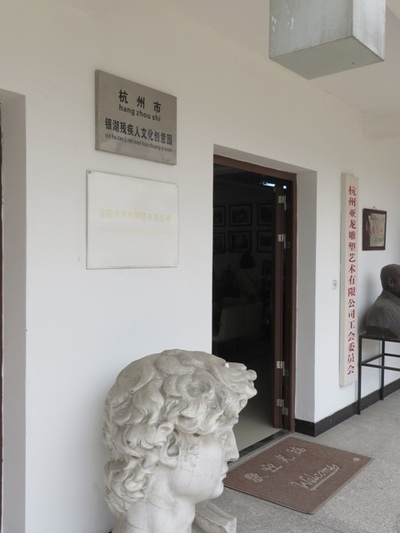 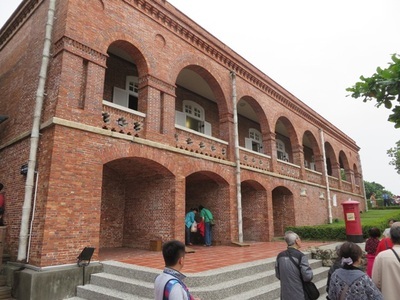 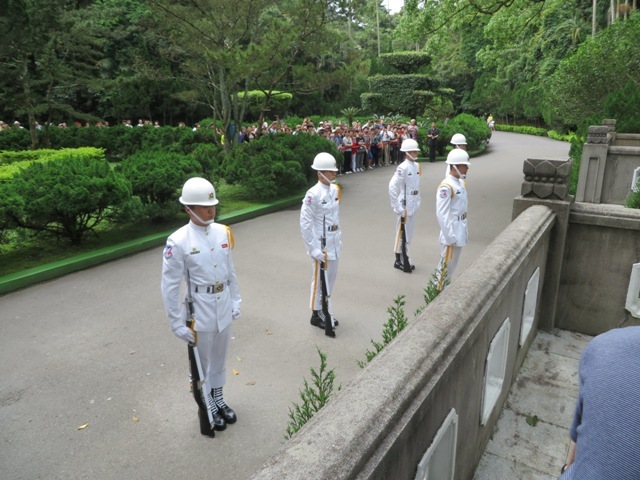 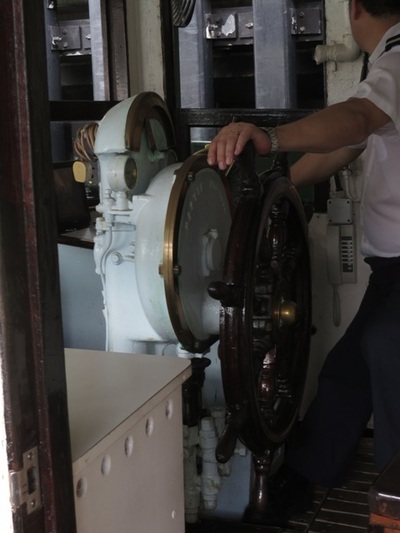 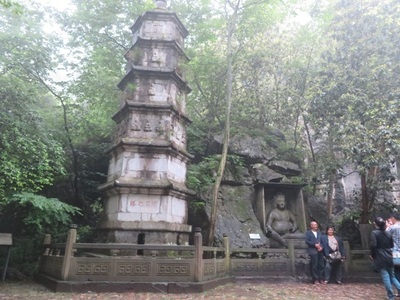 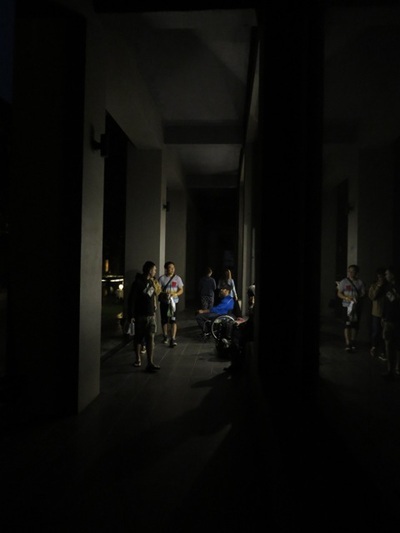 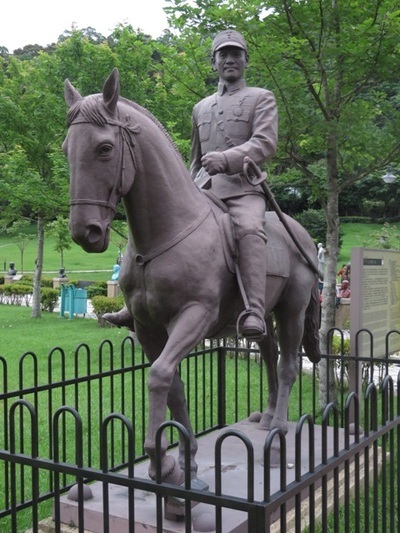 We were also given a tour of the Taoyuan area including the Chiang Kai-shek Memorial Park, which contains the former President's mausoleum and a collection of his statues that used to be omnipresent around Taiwan before the democratic movement. But before Hangzhou, a quick layover in Hong Kong to meet with the Hong Kong Federation of Handicapped Youth, a NGO that pushes for accessibility in public venues and employment for people with disabilities. 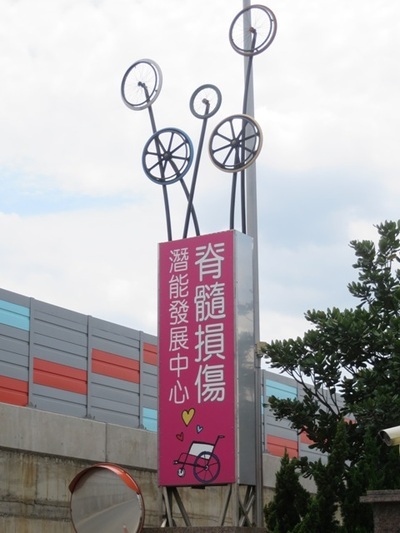 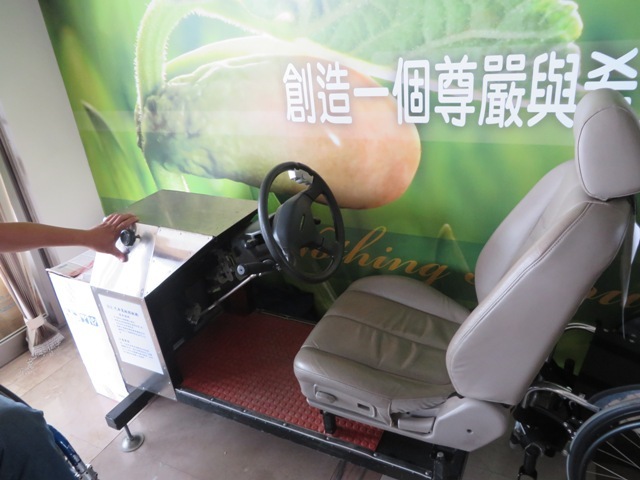 We visited their center in Lok Fu, which includes two social enterprises that employ mostly disabled individuals as well as sports facilities and even a climbing wall! 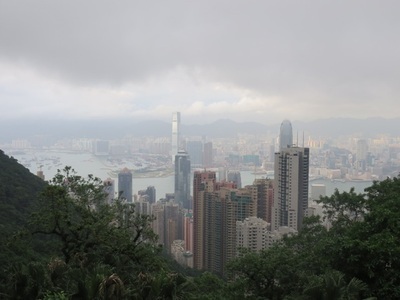 After a quick trip to the top of Victoria Peak to view Hong Kong, we were back to the airport and on our plane to Hangzhou. 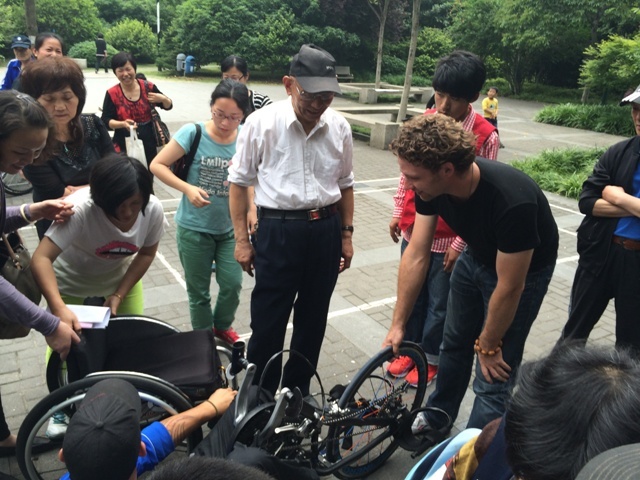 The culmination of our trip was in Hangzhou where we held China's first handcycling clinic with members of the community as well as representatives from the Disabled Persons' Federation and the local government. 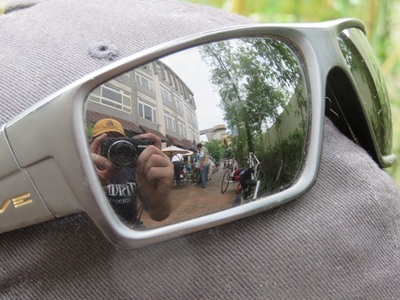 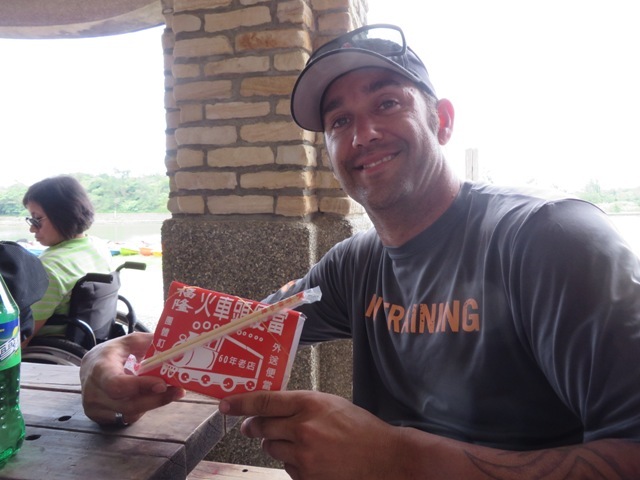 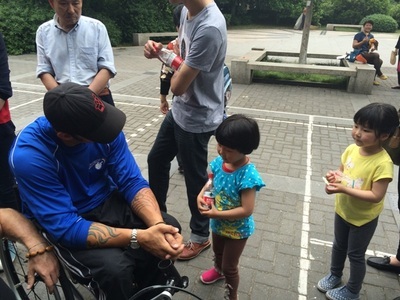 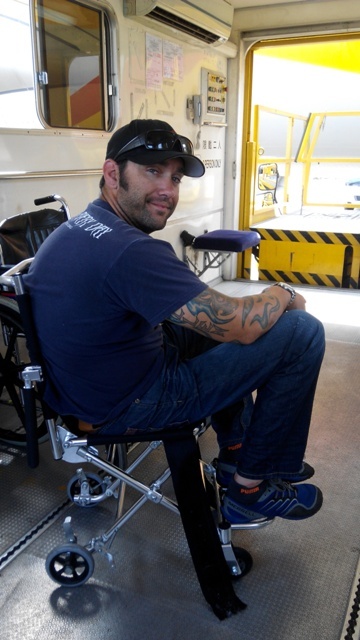 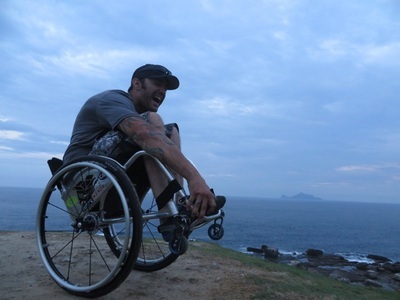 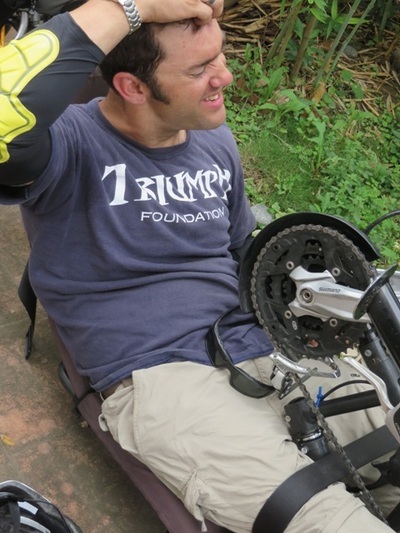 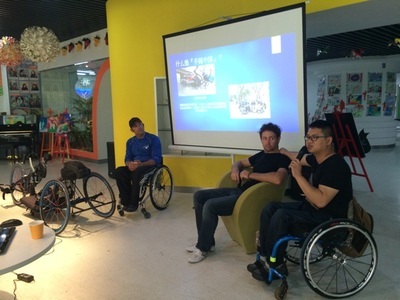 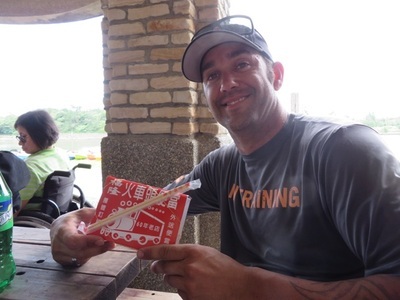 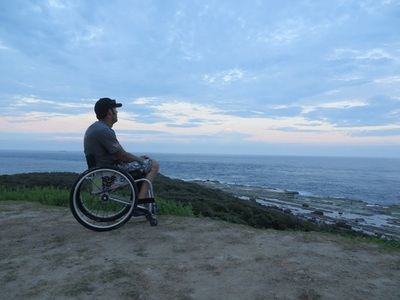 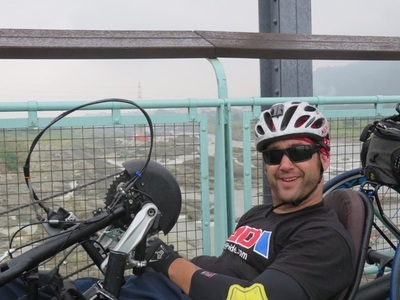 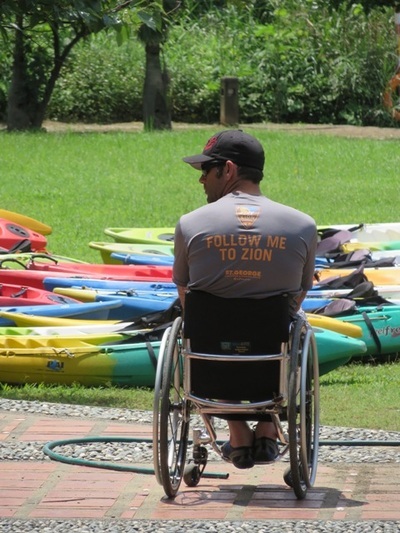 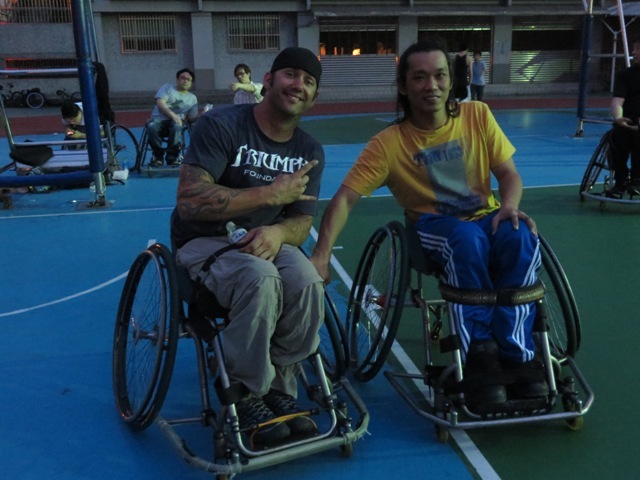 Dom spoke about his experience, handcycling in the U.S. and our goals in China. 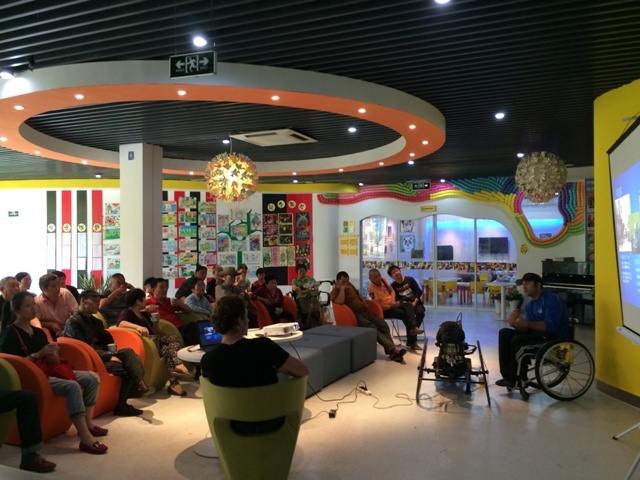 At the end of the talk, Dom was joined by Wang Feng, a native of Zaozhuang in Shandong Province, who has joined our efforts. Also paralyzed following an illness, Wang Feng talked about his experience meeting Dom and how sports and an active lifestyle had given him more confidence and enabled him to do more. Following the talk, which lasted for about another 30 minutes with questions about Dom and his bike, we moved to a nearby park where people could actually get in the bike and try it out. Bystanders also continued to gather around with questions coming from everyone regardless of age or physical ability. 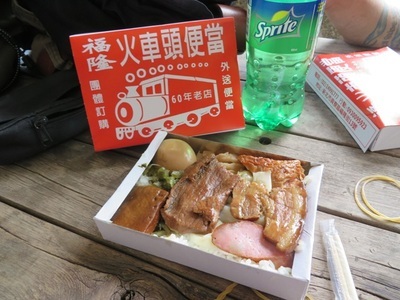 It was exactly what we had wanted!! With a morning to have some fun, we took the bus to Lingyin Temple, one of China's most beautiful, then back to our hotel and to the train station to begin the final leg of our trip - first to Zaozhuang to visit with a few friends and then on to Beijing where we met up with both the China Charity Federation and the Disabled Persons' Federation to discuss future projects and activities.